New Disease Reports (2009) 19, 53. In the spring of 2006 and 2008 a serious outbreak of a suspected bacterial blight disease was observed on zonal geranium (Pelargonium hortorum) and ivy geranium (P. peltatum) plants grown for potted production in commercial greenhouses in the Turkish cities Adana, Mersin, Izmir and Istanbul. Disease symptoms on P. hortorum were V-shaped leaf yellowing (Fig. 1), wilting, and stem necrosis but not leaf spots. The vascular system was discoloured, dark brown to black. 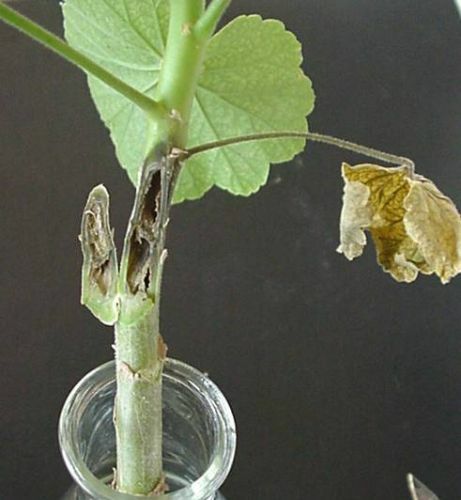 However, the disease symptoms on P. peltatum were typically small round leaf spots or large, angular necrotic areas on leaf surfaces with stem necrosis (Fig. 2) but not wilting. Round leaf spots begin as small (2-5 mm), pale yellow, water-soaked areas on the underside of the leaf. Within two to three days, the spots become well defined, slightly sunken, and turn dark brown to black. All infected plant samples reacted positively with the ImmunoStrip test for Xanthomonas hortorum pv. pelargonii (Agdia). Isolations were made from leaf spots and discoloured vessels of the geranium plants on yeast dextrose calcium carbonate (YDC) agar. 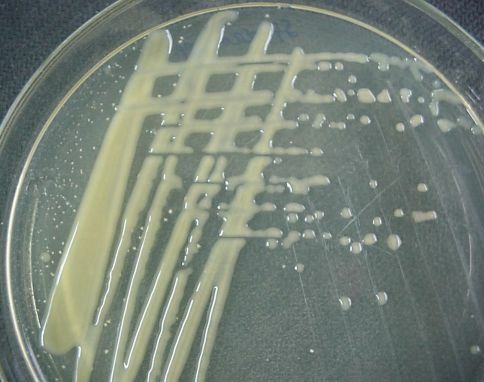 Twenty-one bacterial isolates from the diseased tissues formed yellow-coloured mucoid and convex colonies on King’s medium B (Fig. 3) and YDC medium. All these isolates were characterized as non spore-forming, Gram negative, rod-shaped, motile, aerobic, oxidase-negative, catalase-positive and amylolytic-positive. Pathogenicity was confirmed by stab inoculation of healthy geranium cuttings with pure cultures of 21 isolates (Nameth et al., 1999). Reference strain GSPB 1955 and sterile distilled water were used as positive and negative controls respectively. 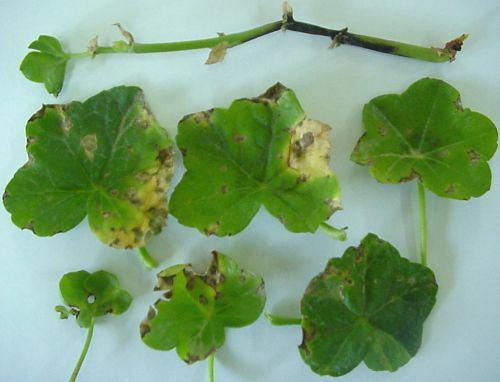 Characteristic brown lesions at the point of inoculation were observed within five to seven days on geranium cuttings for all tested isolates (Fig. 4). Identification of the isolates was confirmed by DAS ELISA and by polymerase chain reaction amplification with pathovar-specific primers (Fig. 5). A 1.2 kb fragment specific for X. hortorum pv. pelargonii (Manulis et al., 1994) was obtained, as well as a 197 bp DNA product with the primer pair XcpM1/XcpM2 (Sulzinski et al., 1996). All of the test results were similar to those of the reference strain GSPB 1955. This is the first report of occurrence of bacterial blight disease caused by X. hortorum pv. pelargonii on geranium plants grown in commercial floriculture greenhouses in Turkey. The study was supported by TUBITAK with the project number TOVAG 106O333. The reference strain GSPB 1955 was kindly provided by Dr. H. Batur-Michaelis, Georg-AgustUniversity, Göttingen, Germany. Manulis S, Valinsky L, Lichter A, Gabriel DW, 1994. Sensitive and specific detection of Xanthomonas campestris pv. pelargonii with DNA primers and probes identified by random amplified polymorphic DNA analysis. Applied and Environmental Microbiology 60, 4094-4099. Nameth ST, Daughtrey ML, Moorman, GW, Sulzinski MA, 1999. 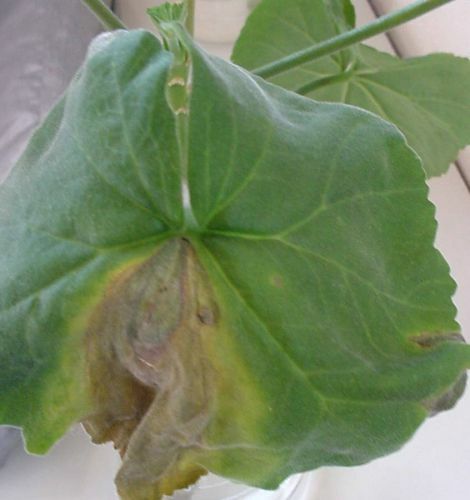 Bacterial blight of geranium: A history of diagnostic challenges. Plant Disease 83, 204-212. Sulzinski MA, Moorman GW, Schlagnhaufer, B, Romaine CP, 1996. 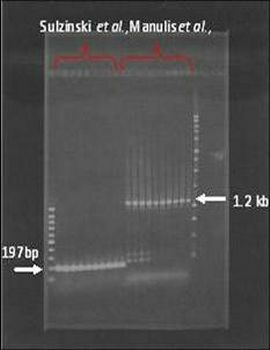 Characteristics of a PCR-based assay for in planta detection of Xanthomonas campestris pv. pelargonii. Journal of Phytopathology 144, 393-398.